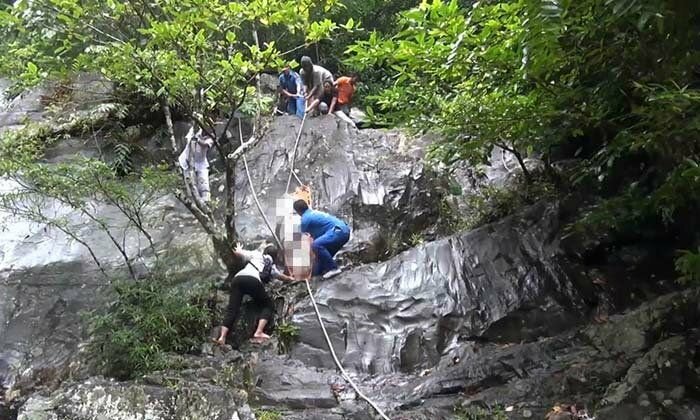 Police are investigating the fatal plunge of a Chinese female tourist at a waterfall in Hat Yai district of the southern province of Songkhla to determine whether it was an accident or an act of foul play. The body of the tourist, identified as Ms Lei Tian, aged 28, was found in a pool of the first tier of Tone Nga Chang waterfall in Hat Yai on September 20. It was initially believed that the victim might have accidentally slipped and plunged into the pool and drowned. However, police later suspected that her death was not an accident after they found her handbag dumped in a garbage bin at the waterfall. They also found her mobile phone in the pool with its SIM card removed and her passport which was torn up. well was the bag put in the bin before she died or after? If she was murdered surely the murderer would be smart enough to do a little better. Almost seems like shes had enough and decided to end things and im never one to scream suicide. I think rarely are they ever suicides. No. This is just an oportunist. She has gone over either by accident or not and then someone has seen the bag and decided to see what goodies they could find. Thai media is reporting that police highly suspect that the Chinese tourist found at some waterfalls in Hat Yai last week was murdered. There are many irregularities and a man who they say knows the victim is helping with inquiries. He has denied knowing her or any involvement in her death. Thai media says the couple worked together in Malaysia. Lei Tian, 28, was found dead at the Tone Nga Chang falls last week. It was initially thought she may have fallen and reports at the time suggested that she was alone. But since then this has proved to not be the case. Deputy chief of the Thai Tourist police Pol Maj-Gen Surachate Hakpan has ordered the formation of a task unit to investigate. Sanook reported that Lei Tian arrived at the falls in a taxi that was following two men in a white Honda City. When they arrived at the falls the taxi driver said that one of the men told him he didn't have to wait for Lei Tian. The taxi driver said that the man appeared to know the woman. Other evidence is clear that something untoward has happened. Some of the victim's possessions were found dumped in a trash can. Her phone was found in the falls but it did not have a SIM card. The man she allegedly met - and who Sanook reported worked with her in a software company in Kuala Lumpur - left his Had Yai hotel after the incident and went first elsewhere in Songkhla then to Krabi where he was picked up. He is under interrogation and is denying knowing the victim. Sanook said that Lei Tian flew to Thailand from Malaysia while the man under interrogation and another man drove through Sadao to enter Thailand. Well, they have to do something now for the Chinese after the debacle of the tourist deaths in the boat sinking. They will probably sacrifice some poor Burmese bugger again which will allow them to redeem some of their so important "Face" with the Chinese government that has caused such a deep decline in Chinese tourists visiting the country - How else will they get back their GDP to where they expect it - Small price to pay. Read the update. Three people arrived. Two people left. One of the men who left works with her. A tad tad suspicious that they would leave her alone like that. Though they could always say that she insisted. Well that's a bit suspicious. You'd be surprised, criminals are often stupid and don't think of such things. the police already stated it was highly likely murder. it sounds like they are also onto a suspected perp and already have him helping with inquiries. Her passport was torn up, sounds like an attempt to erase her, also sim card missing. Rejected lover go for the guy who worked with her but didn't know her. "The man she allegedly met - and who Sanook reported worked with her in a software company in Kuala Lumpur - left his Had Yai hotel after the incident and went first elsewhere in Songkhla then to Krabi where he was picked up. He is under interrogation and is denying knowing the victim. " If he worked with the victim, was at the falls at the same time but denies knowing her, I'd say it's odds on that foul play was involved. Poor lass. He's in custody for questioning and my guess is he's up to his neck in mire ! !